YummyInTheCity: Yogurt Wars - And the title goes to...Red Mango! Yogurt Wars - And the title goes to...Red Mango! hrmm...I think that's what Starbuck's thought about coffee...and look what's happening to them now. The most recent display of the aggressiveness of the fro-yo expansion is the recently opened Pinkberry and Red Mango on Bleecker street..
"Bleecker St., nr. Sullivan St. Pinkberry and Red Mango, 82 feet apart"
"St. Marks Pl., nr. Second Ave. Pinkberry, Red Mango, and Very Berry, within 157 feet"
"Roosevelt Ave., nr. Main St., Flushing Pinkberry and Red Mango, 85 feet apart"
Hrmmm....not sure how to comment on this except to say that last week when I visited the Bleecker street locations, both seemed overflowing with the slight edge towards Pinkberry. Folks, I have to give my verdict on flavor: And the winner is Red Mango! 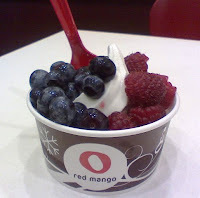 There has been a lot of press about Red Mango being the true original import from Korea. However, Pinkberry burst onto the market with an aggressive expansion plan very reminiscent of Starbucks in the 1990s - is it a surprise that Starbucks is an investor in Pinkberry? One more thought on the whole obssession with frozen yogurt. Do people even like the yogurty taste? Well, I am not a fan of yogurt in general, and I have to say it is an acquired taste. After many trips accompanying the legions of girlfriends with mild to obsessive addictions, I can now say I am a fro-yo fan and I don't even need the other flavors to dilute out the yogurt taste anymore! It's original for me now - original + mangoes+ sliced almonds (it gives it a nice crunch). Pricey, no? Well, we New Yorkers seem to be immune to anything now.